Exhausted. Dang all those dramas that premiered in the same week! Yesh yesh. I saw the requests in the thread. It’s so easy to leave a request and not see or care about the effort behind the process for uploaders. I think I need a break from this uploading business. Doing it for consecutive years slowly drains me from the actual enjoyment. And only some of ya’ll are with me! Synopsis: He Ting Yu is a famous violinist who’s just returned from an overseas tour. Chen Hai Jie is a hardworking dreamer who came to the big city to become a world class violin player. Lan Die Fei is a charming girl who has a beautiful voice and an ear for pitch. Alice is a mysterious girl from Japan who wonders the streets searching for the secrets of her past. Alice: Not this Alice here. This one prefers to steer her virtual ship in the wild sea than stay trapped in the city. What can I say? Please don’t complain about it being rmvb format (I know it’s messy/fuzzy/blah). I would personally want HQ files too but Taiwanese dramas rarely get that treatment. Some popular ones do get HD release later. I don’t hold any promises. ke! 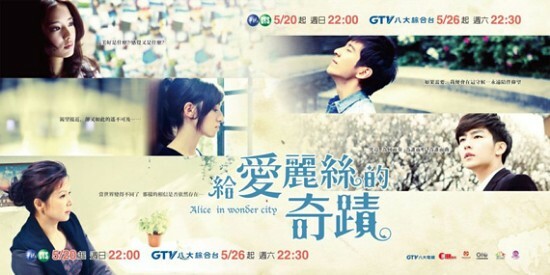 This entry was posted in Drama Episodes and tagged Aaron Yan, Alice in Wonder City, Lara, Tracy Zhou Cai Shi, Twdrama, Xiu Jie Kai by Kappy. Bookmark the permalink. thank you so much for uploading this drama ! I was really looking forward to it ! >> That’s why I try not to write any request of drama/program/subs in any website ever. Just simply enjoy what’s on the table, even enjoy waiting moment. But maybe it’s difficult for some people to suppress their desire to watch certain highly anticipated ones. I really appreciate your work. In some place, I believe your works can cure some people’s bad day, as it happened recently to me. Thank you so much! Heeeee! I was having a krappy day so I ranted on the top, don’t mind me. But it’s true somewhat, this uploading business is far from rewarding, especially in this period where stable file hosts are hard to come by. Then the fact that only a small amount of people download….really deals the final blow to me. Before megaupload shutdown, our links have the highest hits around – Drunken to Love You reach over 200,000 downloads (of course, other sites leeched from us too, shame on them), City Hunter bordered around 180,000, Heartstrings hovered over 200,000, and Best Love settled in the 150K mark. Sigh, those glorious days make me feel wistful…..and sad. When the thread has few comments, uploaders start to worry: “Do people like this?” “Are they watching?” It’s stressful. Gah! My PC is back online *dances around the room* but handphone still mehh. Anyway, is 2012 is Arashi year? Most members are in mistery/detective drama. Too bad the drama is slow in subbing, so I’m a bit discouraged to continue watching :(. For now, I think I’ll watch the one you upload here. Last question: where can I get the engsub for jdrama and c/t/hk drama? The links for BBJX should still be working fine. Better download now when the links are still working before they all die after 30 days. I tried to watch that Jdrama Holmes but it doesn’t stick with me, although the chubby man is cute. Thank You for your hardwork… Are you have the links for the small file or where i can find links of this drama?? it’ too big for me to download… i can’t provided yet…. Thank you very much.. Thank you so much for upload this drama! .rmvb format is totally ok, sure! I was looking for those eps everywhere, but without find them. Now I’ve and I’M SO GRATEFUL to you! Hope you keep uploading amazing dramas (especially TW since no one share them anymore anywhere, sob). @Shanny – i dont even think subs with real player is an option. i use media player classic with real alternative codec and rmvb files play fine. Is anyone having a problem downloading episode 7, the links won’t work for me. Can someone help. Thanks for all your hard work. Click on the light gray button “Download or watch”. The other buttons are ads. Thank you so much Kaptain A. I really appreciate it. I meant that I’ll be deleting the videos on my laptop after the dramas completed because I need space for upcoming goodies. The links stay, whether they’re dead or alive. I’ll be accepting episodic requests from fans for the next 2 weeks. Neka links are dead but uploaded.to links are still working. – MediaFire, 2shared = 200MB file size limit. I don’t do split files. – Rapidshare used to be really fast on my end but nowadays it’s extra slow so I only upload small file sized soundtracks. It stalls when I upload, sometimes for hours without progressing. Episode 4,7,9,10 has been reuploaded. Thanks for reuploading. I know uploaded is working, but I can’t download from it, really. I’ve tried so many times without been able to download. Does anybody know where I can get the subs for this drama? @kissme100: I’ve subs for the first 4 episodes. It’s not much, but if you want them, I can send it to you. I think it’s just me in this lonely, cold post. need some fire to keep away the cold? I dislike doing business with Rapidshare. Too long to upload. Episode 13 & 14 are posted. I honestly didn’t like this drama. The chemistry didn’t click. I stopped watching at episode 6.